One night during my pastry skills course, I was in a discussion with two other classmates over cookie recipes and how to achieve the proper texture at elevation. I’ve learned from Shan to try removing the leavening agent for my elevation and it seems to work well with most of the cakes I bake. He was passing by during our conversation and couldn’t help but interject, “freeze the dough”. I made a mental note to give it a try. I used to bake a lot of cookies. It was easy in graduate school because I could bring in a double batch of cookies, set them in the office, and send the email out to the department. They’d be gone in a couple of hours. Graduate students are always hungry. I made cookies at least twice a week for stress relief and I fine tuned my recipes to the perfect texture – at sea level. When we moved to Colorado, I was disappointed with how many of my recipes had to be readjusted. I didn’t feel like wasting my time because I didn’t know where to start tweaking. Since we’re hitting the road tomorrow, I thought Jeremy might like to nosh on some good old choco-crisp cookies. And I finally felt I could handle messing around with the recipe. I originally got this recipe from my ex-boyfriend’s mother. But… I didn’t like how buttery it was. It spread too thin and was on the overdone side, in my opinion. I modified it after we broke up, with a better cookie dough that had more body. *snicker* The key ingredient that most people are unable to pinpoint is cornflake crumbs. I find great satisfaction in smashing the cornflakes with a rolling pin. This time, I omitted the baking soda and tried baking a sheet of room temperature dough and a sheet of frozen dough (well, i popped the sheet into the freezer for 20 minutes). What I found (and independently verified with Jeremy’s feedback) was that the frozen dough cookies had a superior texture: crispy outside and soft, chewy inside. The cookie had much better structure too. 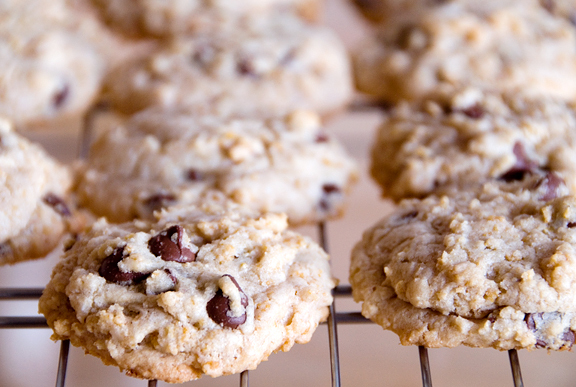 The regular dough cookies were more uniform, a little hard, and slightly dense. The taste was the same, although I think because I omitted the baking soda, I should have increased the salt a tad. Oven: 350°F (325°F @8500 ft.). Cream together butter and sugars. Beat in eggs one at a time and then add vanilla and mix well. Add the flour, soda, and salt and mix. Then add the chocolate chips and cornflake crumbs. 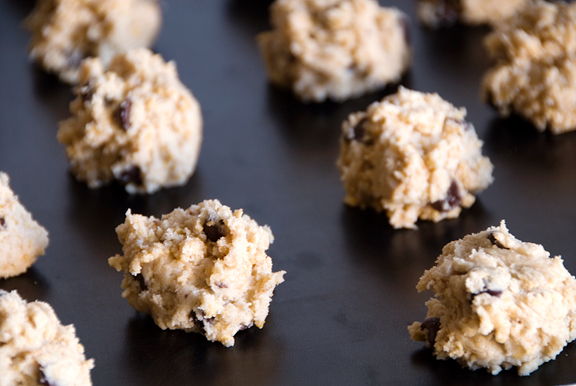 Drop by rounded spoonfuls onto a baking sheet. Freeze the baking sheet for 20 minutes. Bake 15 minutes at sea level. Bake for 15-20 minutes @8500 ft. (check for the bottoms to turn golden). 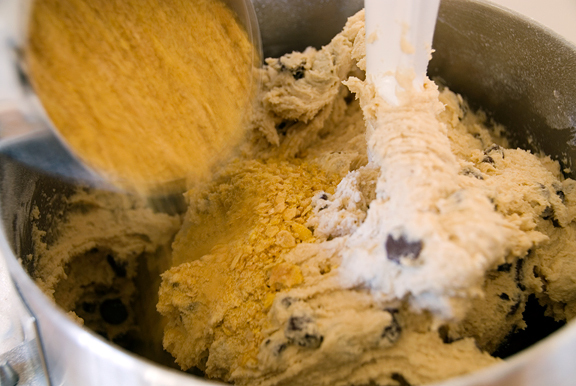 I usually let cookie dough rest in a bowl in the fridge for an hour or two before I bake. The main reason is that it’s easier to scoop. A bonus is that while it rests, the gluten soaks up a little moisture from the eggs. I’ve only refrigerated slice cookies, not drop cookies. It was never a problem at sea-level to just bake the cookies at room temp, but things don’t behave the same up here (and it’s really dry too). Amelia – my guess is that you might have measured something incorrectly. Humidity won’t make THAT much of a difference in this dough. Good luck. i forgot to get back to you. they ended up becoming disappointingly flat (because the batter wasn’t all that ‘solid’ i suppose) and were a lot softer than they looked, even nicely browned and everything. i am going to continue experimenting a bit more and even though i think i tried measuring out everything properly, i might have done something wrongly. ah well. that’s a beginner for you. i’m gonna try a bit more and update you when i do! :) thanks anyway. ps: would being too enthusiastic with creaming butter and sugar cause a problem? Amelia – I think it sounds like you may have had too much butter if it spread so much. I recenly tried to bake these cookies for my son’s birthday but i think i added a little bit more butter and they did not turn out as in the recipe here. The problem was that i promised my son that the next time they will be perfect. Let see how this will go. Mary – yes, too much butter – oh, could there be such a thing?! ;) – can make your cookies spread too much. Try freezing or refrigerating the dough? I wish I would have read this before trying to make my ‘snickerdoodle’ cookies! I made two batches and ended up throwing away the dough – next time I will try to change recipe and baking soda content!! What is the orginal chic crisp cookie? Does this cookie come out crispy? Renee – I’ve reposted the original. It comes out crispy outside, chewing inside with crispy bits from the corn flakes. I found using bread flour for cookies with a high fat to flour ratio and the refrigeration help maintain the structure. Bread flour contains more protein to bind with the fat. I use the same measurements and the same leavening ingredients.